Remark: SMP supports is not available for 32-bit Linux guest operating systems running on Windows Server 2008 Hyper-V or Microsoft Hyper-V Server 2008. 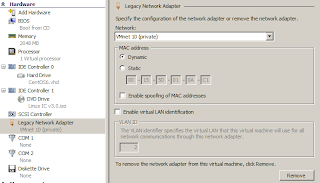 Before installing the linux which is CentOS or Red Hat Enterprise, you have to install "Legacy Network Adapter" for this VM. You must not install the "synthetic network adapter". If you install "synthetic network adapter" for the VM, you can't find the network adapter for which you installed the Linux Integration Services. Assuming the CentOS was installed. 1. 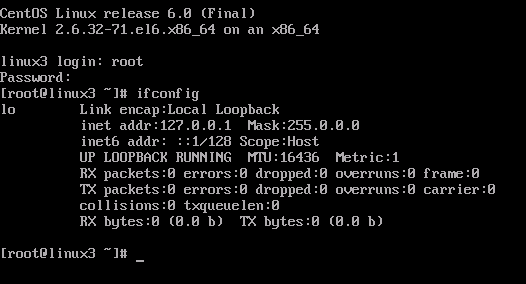 Insert "Linux IC v3.0" into the CentOS VM. 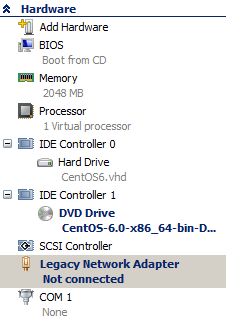 CentOS can't detect the network adapter. 4. Enter "mount /dev/cdrom /media/" to mount the CD. 5. For 32-bit Linux, enter the following commands to install "Linux Integration Services". 6. For 64-bit Linux, enter the following commands to install "Linux Integration Services". 7. Enter "nano /etc/sysconfig/network-scripts/ifcfg-eth0" to edit the network adapter. 9. Press "Ctrl + O" to save. 10. Press "Ctrl + X" to exit nano. 11. Enter "halt" to shut down the VM. 12. Edit the VM hardware setting. 13. 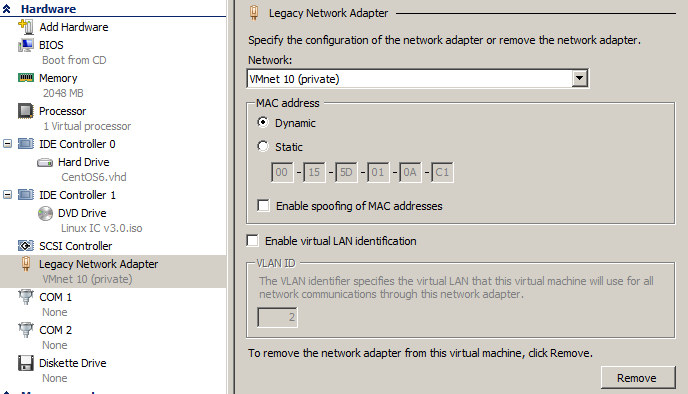 Write down the current MAC address, remove the "Legacy Network Adapter". 14. Add a Network Adapter. 16. Next to "MAC Address", select "Static". 17. Type the MAC address which you wrote down. 19. Power on the VM. 20. Log in as root. The Linux Integration Services was installed in the CentOS and the "synthetic network adapter" work properly.